Adygine Station; Institute of water problem and Hydropower, Kyrgyz National Academy of Science. The station is located in Northern Tchein-Shan on Northern slope of the Kyrgyz range as part of National nature park Ala-Aracha. The locality is built by a glacier-moraine complex lying at an altitude of 3 400 – 4 200 m above sea level. The huge moraine consisting of a few generations of glacial till is about 3.5 km long. The apical part of the locality is covered by a glacierA glacier is a large, persistent body of land-based ice that forms over many years where the accumulation of snow is greater than its loss (ablation). The ice in a... More extending as far as the summit of the Kyrgyz mountain range (Kyrgyz Ala-Too). 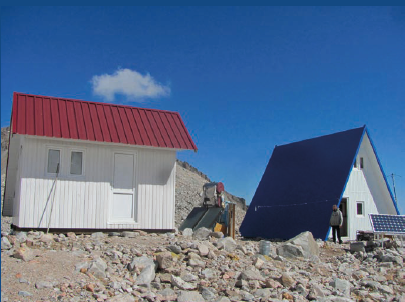 The station is located, on 3600 metres above a sea level. The climateThe average weather we would expect over a long period of time (seasons, years, decades). Climate varies from place-to-place across the Earth. Climate is determined by long-term (over at least... More near station area of the polar and sub-polar. The vegetation of the tundraA type of ecosystem in which tree growth is limited by low temperatures. The origin of the word is from from the Kildin Sami word tūndâr, meaning "uplands" or "treeless mountain tract". In the northern... More and presented to mosses, lichens and unique flowers listed in the Red Book. FaunaThe animals that live in a particular region, habitat or time (such as geological period like the jurassic). For plants, we use the term flora, and to collectively refer to all... More is represented by wild goats, yaks, snow leopard (irbis). The station was built in 2008 year in a joint Kyrgyz-Czech project. The building of the station has a lay-out of the letter A and dimensions 6.5 x 7 m. It consists of a ground floor and an attic room. rooms each 2.5 x 2.8 in size are the major part of the building. The second room is a study and at the same time a dining room. Two rooms in the attic room can be used as a. Each room can easily accommodate three persons or even four if necessary. The energy is generated mostly by a wind turbine unit and solar panels. Monitoring of hazardous lakes. The development of all lakes and changes in their size, shape and water level are monitored. All changes in morphology of moraine damsare also monitored. Meteorological observations: Two weather stations were installed at the locality within the program of climate monitoring. One of them is situated near the building at lake level and the other one above the glacier at an elevation of 3 830 m above sea level. Glaciological studies: This investigation is intended to monitor all phenomena related to glacier retreat and changes in its volume. The data acquired from automatic instruments are transmitted into a notebook. Hydrological studies: Hydrological research is an integral part of monitoring of the development of lakes and their inflows and outflows. A hydrological balance of lakes will be established based upon the measurements undertaken. Other investigations: In addition to studies carried out within the project, the station is open to Kyrgyz and foreign scientists for their projects that can be focused on seismology, atmosphere and the content of greenhouse gases, botany, etc. The station is open to research projects of the Kyrgyz and also to scientists of foreign universities and research institutions. The station is 40 km from the capital of Kyrgyzstan – Bishkek city. The Adygine locality can be reached from the main Ala-Archa valley through which runs an asphalt road. A trail for horses goes through a valley from the road as far as a place about 6 km away from the locality. From the Airport to the city of Bishkek can be reached in 40 minutes (30 km), then to the national Park Ala-Archa 40 km and then on foot or on horseback, you must overcome 9 km of mountain routes.